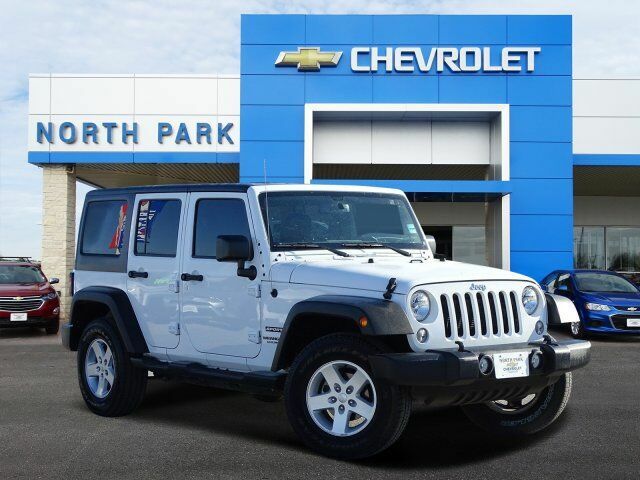 SIRIUS SATELLITE RADIO, RADIO: 430,4x4, Brake Actuated Limited Slip Differential, CD Player, BLACK 3-PIECE HARD TOP, CONNECTIVITY GROUP, QUICK ORDER PACKAGE 24S, TRANSMISSION: 5-SPEED AUTOMATIC (W5A5... TUBULAR SIDE STEPS AND MORE! 4x4, CD Player, Brake Actuated Limited Slip Differential. Jeep Sport with Bright White Clear Coat exterior and Black interior features a V6 Cylinder Engine with 285 HP at 6400 RPM*. QUICK ORDER PACKAGE 24S Engine: 3.6L V6 24V VVT, Transmission: 5-Speed Automatic (W5A580), Front 1-Touch Down Power Windows, Remote Keyless Entry, Deep Tint Sunscreen Windows, Leather Wrapped Steering Wheel, Chrome/Leather Wrapped Shift Knob, Power Heated Mirrors, Tires: P255/75R17 OWL On/Off Road, Power Convenience Group, Power Locks, Wheels: 17" x 7.5" Aluminum, Auto Dim Mirror w/Reading Lamp, Security Alarm, TRANSMISSION: 5-SPEED AUTOMATIC (W5A580) Hill Descent Control, Tip Start, BLACK 3-PIECE HARD TOP Rear Window Defroster, Delete Sunrider Soft Top, Freedom Panel Storage Bag, Rear Window Wiper/Washer, CONNECTIVITY GROUP Uconnect Voice Command w/Bluetooth, Vehicle Information Center, Remote USB Port, Tire Pressure Monitoring Display, RADIO: 430 Remote USB Port, TUBULAR SIDE STEPS, SIRIUS SATELLITE RADIO, For More Info Call 888-539-7474, ENGINE: 3.6L V6 24V VVT (STD). Steering Wheel Controls, Child Safety Locks, Rollover Protection System, Electronic Stability Control, Bucket Seats, Brake Assist, 4-Wheel ABS.